Perfectly located on the Kona “Gold Coast” of the Big Island between the charming Village of Kailua~Kona and Keahou Bay, this home offers you your own personal paradise. From the moment you drive up to this dramatic gated, Ocean Front Estate you will feel the rare privacy as you make your way along a unique koi pond courtyard through lush tropical gardens to an expansive multi-level, entertainers’ home where the expansive yard expands directly to the ocean. Gracious 5,000 sq.ft. home with unparalleled 300 foot-long private ocean access offering a one of a kind getaway experience. Sleeps 10 comfortably offering 3 suites each very private from the other. 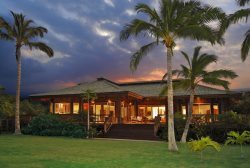 This one of kind “Lucky Bennett” designed home is a rare find for the guests who truly appreciate Hawaiian Style living. Polynesian Inspired design throughout this open home with gentle ocean breezes to keep you cool while relaxing pool side and enjoying amazing Views of the Pacific. Koi pond as you enter the gated front entrance and water fall gardens set an ambiance, natural wood tones complete the mood to start your vacation immediately. On ocean side of home the kitchen opens up to expansive covered lanai with large dining area under the magnificent old growth trees that keep the yard cool and shady. Master bedroom with separate entrance alongside the Koi pond entrance is quite large and with oversized doors opening up to pool with the Pacific Ocean just steps away. The bathroom offers a charming outdoor/garden shower that offers a very romantic setting. If you have to work while on vacation, there is an large office area adjacent to the Master Suite. There is a wonderful caretaker nearby who will meet you upon arrival and walk you through the home. He is very familiar with the home and will be in the area should you need anything with the home while you are on vacation. To assist with your planning with up to 10 guests (including children) there are three separate suites. ~ Master has King Bed. ~ Second downstairs suite has King Bed and air conditioning. ~ Upstairs suite offers 1 King Bed in a private bedroom. As part of the upstairs suite 1 Queen Bed, 1 Queen sofa sleeper, small day bed (twin) on enclosed, open air lanai all facing the ocean. Additional kitchen with full bathroom. ~ There is also a Queen sofa sleeper in entertainment room downstairs. ~ Each bedroom area is quite private from the others and oversized.